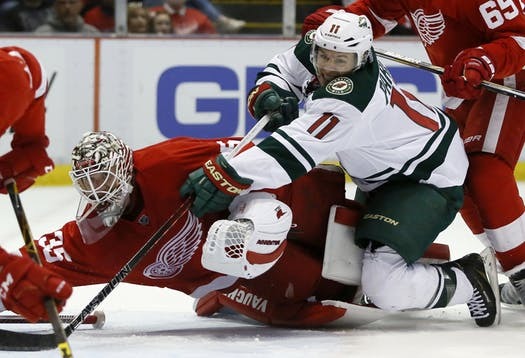 DETROIT – After snapping its five-game losing skid Thursday, the Wild will immediately get a chance to start a different kind of streak when it visits the Red Wings Friday to finish off a quick two-game road trip. The night before, the Wild secured just its second win in February by pulling away from the Rangers 4-1 – a result that swung the team back into the second wild card position in the Western Conference after it fell out of it Wednesday. The Wild is just a point ahead of Colorado and Chicago and since those teams play against each other Friday, one will bank two points. While the outcome was vital to the Wild’s playoff push, how the team manufactured it was an encouraging sign after a string of poor showings. Goalie Devan Dubnyk rebounded from a goal that trickled through him to turn in a steady effort, making 33 saves. The penalty kill, despite giving up the Rangers’ lone goal, still played a significant role – surviving a four-minute New York power play in the third period. And the offense came from all over the lineup – the defense (Jared Spurgeon), the offensive leaders (Mikael Granlund and Zach Parise) and the supporting cast (Jordan Greenway). What’s more, winger Ryan Donato made a solid debut after getting added in a trade from the Bruins in exchange for forward Charlie Coyle. He became the 11th player in Wild history to record at least two points in his first game with the team. Since this was a successful lineup for the Wild, it wouldn’t be surprising if the team relied on the same look to face the Red Wings. But whether or that’s the case won’t be clear until closer to puck drop since the team didn’t host a morning skate Friday in Detroit. 100: Career games for defenseman Brad Hunt. 15: Goals for Parise on the road. 24: Points for Granlund in road games. 6-4-3: Record for the Wild in its last 13 games vs. Detroit. 3: Goals for Red Wings winger Tyler Bertuzzi in his last game against the Wild. Detroit has been up and down lately, going 3-3 in its last six games. The Red Wings are in the midst of a five-game homestand and are coming off a 5-4 overtime loss to the Chicago Blackhawks Wednesday. Overall, the team is 12-14-5 on home ice and ranks second-to-last in the Eastern Conference. Center Dylan Larkin leads Detroit with 26 goals and 58 points. Winger Gustav Nyquist has a team-best 33 assists.